Babies love to be swaddled! If you can imagine how snug and tight it is in the womb before they are born, and this is the kind of environment that your baby is used too. When your baby is born they find being swaddled or wrapped keeps them snug and tight and it is a similar feeling to their waterworld of the womb. 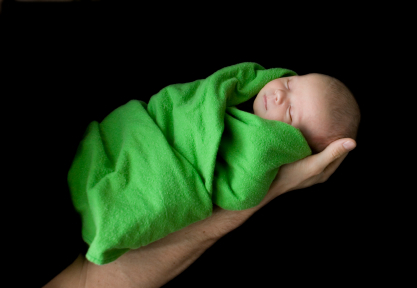 Swaddling also has a couple of other advantages to your baby and too sleep. All babies when born have many different reflexes. One of these is the ‘startle reflex’. Or more technically the “Moro Reflex”. It is named the startle reflex because of how it looks – you will know if your baby is having this reflex because you will see your baby bring his arms out wide before bringing them back together. The startle reflex only takes are few seconds but it can certainly wake your baby up if they are sleeping. Some babies will drift back to sleep other will wakes and cry. The wrapping or swaddling actually minimises this waking from the reflex. Babies outgrow this reflex about 4-5-6 months of age. You might find that your baby doesn’t like to be swaddled and fights the wrap, if this is the case and often is with boy babies then they are really wanting to be swaddled in a different way rather than you not swaddling at all. So change from swaddling with their arms across their chest to swaddling with their arms up near their ears, this has a number of names ie. angel swaddling, hands to heart, and there is a vast variety of different wraps that you can get, my suggestion go for a cotton wrap so that your baby doesn’t overheat. My recommendation is to be careful when wrapping over the hips as it is widely known that wrapping too tightly over the hips and legs cause hip displacement in babies. You really need to aim to wrap tightly down to their tummy and leave their legs and hips free to move and wriggle. Finally your baby will associate the swaddling/wrapping as a sleep cue and once you start to wrap your baby before bed and it becomes part of your routine your baby will know this and start to calm once being wrapped and know that they are going to sleep. It is a very portable cue and can be easily taken everywhere – I would also transition from a wrap to a sleeping bag by about 12 weeks of age.